I know y’all have had those days, whether your a mom or not, THOSE days. Not even the worst days, because they’re almost easier to put words to. But the days when things are ok, but hard. Days when you just feel like you’re letting everyone down. Today’s been one of those days. It’s 11:30 pm, and as I was about to fall into bed, aching from moving and cleaning a fridge yesterday, I couldn’t help but fall to my knees in tears at the side of the bed. One of those days where you manage, but barely, and not with any semblance of grace. You feel like you could have been a better mom, a better wife, a better friend. You feel like you aren’t doing anything well… the house is a mess, the fridge is unorganized, you could do so much better at managing money, walking in the Fruit of the Spirit, keeping up with the laundry. You could play with the kids more, snap at them a little less, have more patience with your husband. The best intentions of the day got taken over by distractions and necessity. You know that you could have found quiet and rest in the Word, and you fully intended to first thing in the morning when your spirit most needed to be grounded in Him but the day just got away… and now you feel like you’re letting your Heavenly Father down most of all. *I’ve turned the comments off because I mostly wrote this for myself, obviously. I didn’t write it for any encouraging words, though I’m sure you would have plenty. But I wrote it because I know you’ve been or will be there, and His glorious grace can speak to all of us. Well, I took my own advice and kept my expectations low for Sunday. And you know what? It was a fabulous day. I got to sleep in (albeit a tiny bit, since we were going to early church). At church, they gave the moms huge, chocolate dipped strawberries. Our lunch plans with Toones were scrapped because they were a little worried about Josiah’s germs (though he was 100% by Saturday morning). Oh well… that meant I didn’t have to cook and clean for company 🙂 Brian scrapped his plans to ride home from church, and joined us to go to the mall to ride the escalator, elevator and the carousel and let the kids get Happy Meals while we had Panera. Fun for all! Brian helped the kids cut flowers from the yardfor me and paint canvases I’ve wanted to hang in the entryway with their handprints. They aren’t exactly what I had imagined, but hey… the kids did it, and I didn’t have to clean up, so they’re beautiful 🙂 It was just a lovely, relaxed day with my beautiful, much beloved family. Funny story… Saturday while Brian was riding, I was trying to figure out something to do to break up the day. I’d seen a sign at the grocery store that kids could decorate cookies for mom, so we headed over there. Analise and I had a long discussion about who the decorated cookies would be for. She was NOT into the idea of decorating them for me or Grandma. We had a bit of a heated discussion about “giving”, and I ended up telling her she could find a cookie for herself when we were done. When we arrived, we found it was not cookies, but CAKES to decorate for $7.50 . Huh. Well, before I could stop her… and really, how could I stop her? She was so gung-ho to decorate something! (And I was going to get $7 worth of coupons with the cake, so that sold me!) She ran on up, picked the little sign for her cake, and grabbed a huge, unwieldy frosting bag. The tips were so tiny, it was nearly impossible for even me to get anything to come out. And the young guy running the show was asking, “What do you want to write for your mommy? How about ‘I love you’?” I’m thinking, hm… she is just now writing her name with a pencil, and you’re expecting ‘I Love You’ with a frosting bag?!? She squeezes out a tiny little bit before the head bakery guy comes and swaps the tips so it comes out a bit more easily. A crowd gathered to watch her intense work at making little squiggles and lines with comments like, “They’ll put you to work in the bakery, you’re doing so well!” I had my hands full keeping an energetic Josiah from knocking over the long table of cakes, poking the frosting on Analise’s cake, and touching all the tips on the other frosting bags. What a boy! I had to laugh as we checked out and the kids were dancing around, feeling all the puffy bags of chips, pretending to eat the treats in the checkout line. 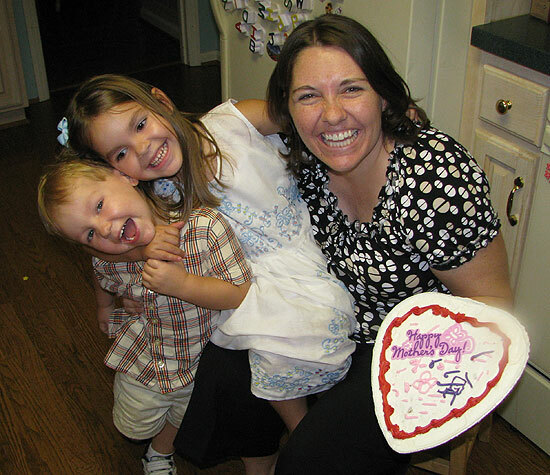 Here I was, juggling the kids to make my own Mother’s Day cake. How funny! The cake was YUMMY and my sweeties gave me a good photo to remember my lovely day! All the sweetness I need! How blessed I am! I’ve had a fabulous week. I was still basking in the glow of my weekend away. But between sickness invading the house yesterday (that seems to have run its course, thankfully), an early wake-up call, and bored grumpy kids, I’ve wound up in an irritated, unappreciated mood tonight. It’s Mother’s Day weekend, and I’m not expecting any gifts because I’ve been TOTALLY spoiled this past month (see birthday, necklace, iPhone and weekend away). But I really was hoping for a little extra obedience, less whining, and overall TLC, generally leading to a feeling of being appreciated.